The first three full-length novels in Lucy Parker’s delightfully charming London Celebrities series, available together for the first time. Have the tides turned? 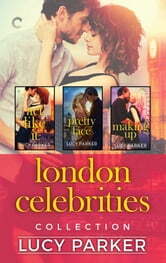 Has English rose Lainie Graham made London’s bad boy a new man? It’s not actress Lily Lamprey’s fault that she’s all curves and has the kind of voice that can fog up a camera lens. She wants to prove where her real talents lie—and that’s not on a casting couch, thank you. Luc Savage has respect, integrity and experience. He also has it bad for Lily. He’d be willing to dismiss it as a midlife crisis, but this exasperating, irresistible woman is actually a very talented actress. Unfortunately, their romance is not only raising questions about Lily’s suddenly rising career, it’s threatening Luc’s professional reputation. Once upon a time, circus artist Trix Lane was the best around. Her spark vanished with her confidence, though, and reclaiming either has proved…difficult. So when she’s unexpectedly thrust into the spotlight, the joy over her sudden elevation in status is cut short by a new hire on the makeup team. When it comes to commitment, Trix has been there, done that, never wants to do it again. And Leo’s this close to the job of a lifetime, which would take him away from London—and from Trix. Their past is a constant barrier between them.